Display Port is also a standard of high-definition digital display interface. 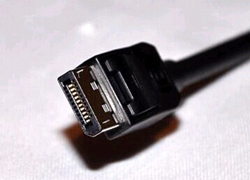 It can connect the computer and the monitor and can also beconnected to the computer and home theater. May 2006, the VideoElectronics Standards Association (VESA) determine the standard of version 1.0 and upgraded to version 1.1 after six months, provides support for HDCP. And version 2.0 is also planed to launch this year. as the competitors of HDMI and UDI and the potential successor to DVI, Display Port has winned the support of industry giants such as AMD, Intel, NVIDIA, Dell, HP, Lenovo, Philips, Samsung and so on. what is more, it is free to use unlike the HDMI as needed high licensing fees. AMD roadmap shows that the company will begin to support Display Port in the end of the year or early next year, instead of HDMI.